Filed patent applications can be found based on specific applicants or inventors. This is helpful in keeping track of rival companies, or of certain inventors, to check on their R & D activities. Fees start at 40,000 yen (about US$480), and search periods are generally from 1-14 days. These searches help to determine the current status of ongoing examinations, continuing applications, etc., of patent applications by rival companies. Details can be obtained by inspecting file wrappers at the Patent Office. Ongoing searches of the examination status of specific patent applications are also important to avoid missing deadlines for filing oppositions against them. Fees start at 8,000 yen (about US$100), and search periods are generally from 1-20 days. Theme searches pick out patent publications and technical documents in a specific area of interest. 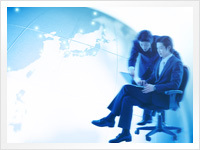 They enable you to determine the latest trends in your field of research and development. Fees start at 80,000 yen (about US$1,000), and research periods are generally from 4 - 30 days. a copy of an article. a. a business trip to Japan is necessary. Information is required regarding the outline of a company to be visited, recent movements of the company, the reaction to a products recently developed by the company, and the profile of a senior officer of the company. b. a copy of a Japanese article revealed during the development of a product is needed. The keys to bind the article are only the title and the author. Further, the author's recent articles, if there are any, are required. c. to comprehensively collect reactions to a case from newspapers and magazines; etc. The information that you and your business need can be obtained both economically and quickly by trained searchers who have searching skills and knowledge.